C-COM iNetVu vehicle mounted antenna. 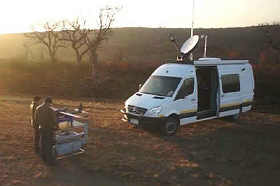 Ottawa, October, 2014 – C-COM Satellite Systems Inc. (TSXV: CMI), a leading global provider of mobile, auto-deploying satellite antenna systems, has announced that its antennas are being used in The Great Limpopo Transfrontier Park located in Mozambique, South Africa and Zimbabwe to monitor and prevent the poaching of rhinos. The combined size of these three parks covers 35,000 square kilometers and is one of the world’s greatest animal kingdoms. The park contains 40% of the world’s rhino population and it has recently become the frontline of the rhino poaching wars especially on the borders of Mozambique and South Africa. A rhino is killed every 8 hours as its horns have become more valuable pound for pound than gold and this relentless slaughter threatens it survival. Saab Grintek, a C-COM iNetVu integrator based in South Africa, is sponsoring a foundation that is working closely with the three governments where the park is situated. The foundation has been testing Unmanned Arial Vehicles (UAV’s), also known as drones. The drones, which are equipped with regular, as well as infrared cameras and thermal sensors for sensing body heat as well as heat from vehicles during the night, are flown and controlled from a specially equipped vehicle. Using the C-COM iNetVu vehicle mounted antenna, the unit stays in contact with the operational center, and any disturbance or potential breach in the conservation’s life is immediately responded to. This setup provides the park rangers with the ability to monitor activities in the park in real-time, day and night and intervene as required, as well as record the action for eventual prosecution of the poachers. “Having the C-COM Mobile unit as the main means of connectivity during this operation, proved to be the best decision we made. 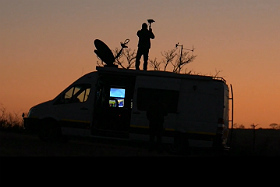 The success and the availability of the system has become the norm of a daily process.“ said Gustav Engelbrecht, Product Manager Satellite Systems at Saab Grintek Technologies. “This innovative solution of using UAV’s in conjunction with the C-COM iNetVu antennas for monitoring and control of large areas or difficult to access locations from the air will open up many new applications. We expect to see a number of our integrators from around the world apply this technology to their existing vertical markets, such as emergency communications and disaster management." said Leslie Klein, President and CEO of C-COM.